The summer season may be on the wane, but there’s no shortage of early autumn opportunities for those with green thumbs or a green conscience to get going and get growing. From sustainability workshops and volunteer activities to seed sales and celebrations, September is a great month for Central Texans looking to go native, brush up on backyard basics, and pitch in to keep our unique ecosystem thriving. At the forefront of the organic farming movement in Texas since the 90s, Richard Sechrist offers a helpful presentation introducing folks to the water-saving practice of raised bed gardening–just in time for Central Texas’ second growing season. Learn how to home grow your very own organic veggies while conserving water and thwarting common garden pests. Citizens Alliance for Responsible Development (CARD) hosts a free community meeting focused on local and statewide efforts to conserve our most vital natural resource. September’s event will feature a “Chat with the Experts.” Five local leaders, including some of Texas’ most respected water experts, will offer specialist advice for families looking to reduce water usage through xeriscaping, rainwater collection, and responsible household usage. Talks will be followed by a 30-minute panel discussion opening the floor for audience questions and general discussion. A great set of local classes that will help you transform even the most arid backyard plot into a flourishing garden oasis. Participants will learn how to use in-ground and raised beds that allow for maximum veggie and herb production with minimized water usage, and get a great general introduction to growing in Central Texas’ unique climate. Learn the ins and outs of rainwater harvesting, composting and mulching, and bio-intensive gardening. A unique series of four workshops presented by Austin Urban Forestry and TreeFolks, these informative sessions are designed to give green-minded urban citizens the tools and know-how they need to be responsible stewards of our urban forests. Topics range from the basics of urban ecology and maintenance to in-depth presentations on insect predators, common diseases, the effects of drought, and how to plant new trees successfully. Each session will be held from 9:00 AM to 3:30 PM at the Chestnut Community Center. In addition to creating an irritating pollen problem, rag weed has a way of establishing itself aggressively–particularly in disturbed areas like trails and river banks–making it all but impossible for other native Texan plants to survive. This a great opportunity for local volunteers to help keep the Battle Bend Springs grow zones diverse and beautiful. Tools, cold water, and KIND bars will be provided, though anyone with a pointed shovel is encouraged to bring it along! Volunteers should also be sure to wear sturdy, long pants, closed-toe shoes, sun protection, and a refillable water bottle. Travis County, the Colorado River Alliance, and Keep Austin Beautiful team up annually to tackle the biggest diving and shoreline cleanup in Texas. In addition to several hundred certified scuba divers that help to scour the lake bottom and round up trash and debris, local volunteers are invited to assist with cleanup along the shoreline of Lake Travis–as well as the ten county parks surrounding this important regional watershed. All ages are welcome, and cleanup will get started at 9:00 AM, rain or shine! Early autumn is the perfect time for planting native wildflowers in preparation for dramatic springtime blooms. On August 23rd Austin’s own Lady Bird Johnson Wildflower Center will be offering in-store specials on native wildflower and grass seeds, so you’ll be ready to sow come September. And if you miss Saturday’s sale event, the Center will also be holding its semi-annual plant sale on October 10th, 11th, and 12th. This year’s event will be held at the Austin Area Garden Center at Zilker Botanical Garden. Entrance is free with admission to the Botanical Garden ($2 adults, $1 children and seniors). In addition to a stunning show of cacti and succulent species from around the world, there will be plenty of specimens for purchase from regional vendors. The exhibit will also feature a daily silent auction, hourly plant raffles, opportunities for advice from the experts, and pottery handcrafted by Austin artist Rick Van Dyke. From family fun and educational opportunities to a special sale exhibiting local plants that attract vital pollinators–including beautiful butterflies–Zilker Garden’s Monarch Appreciation day is not to be missed! The day will feature a series of lectures in the Garden Center Auditorium, including topics such as “Best Practices for Pollinators,” “What You Can Do to Help Bees: A Beekeeper’s Perspective,” “Monarch Waystations: A Monarch’s Field of Dreams,” and a presentation about Austin’s ongoing habitat challenge for neighborhood pollinator gardens. And there will be plenty of fun activities for kids too: a live display beehive, build-a-bee-house workshops, face painting, interactive mural activities, and butterfly tents and tables where children and adults can meet and greet local caterpillars, moths, and butterflies. Previous: Previous post: August Conservation Activities: Riparian Restoration, Gardening Guru Guidance, and Green Family Fun! There really is still so much to learn especially when you are into gardening and landscaping. The topics look so interesting and very timely too. I really love the idea of being able to transform the look of your place using your skills. Very rewarding! After Central Texas experienced the worst drought in recorded history in 2011, I felt the need to do something different with my yard. I did not want to waste water trying to make my lawn grow in a climate that was not well suited for it. 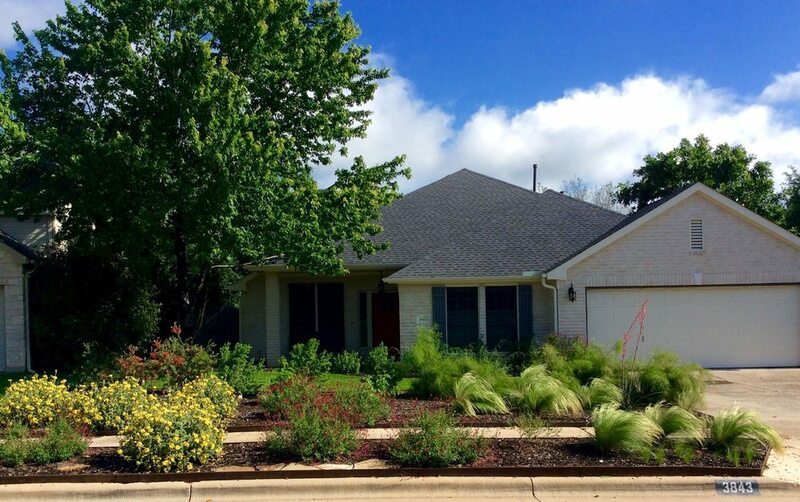 Texas Native plants were the logical solution and I started investigating landscapers who could help me design a more natural environment.